A lot of businesses frequently use the term Digital Transformation, but what does it actually mean? We have become so accustomed to digital technology, we are no longer able to imagine life without it. And yet, when it comes to the digital transformation of the work environment, we still have a long way to go. The greatest obstacle for digital transformation is simply, people. There are a number of things that don’t have to do with technical innovations that are going to make the process more complicated. That’s not to say that creating the proper infrastructure to accommodate the rapid pace of development is not going to be a major issue in and of itself. But a number of key factors in implementing digital solutions are related to people. And while is relatively easy to change and adapt to new technology, people are not. Many global companies start to realize their business will be mostly digital within the coming years, but not many are really interested in dealing with the digital transformation. Hopefully, the situation is not as grim as it sounds, we can tear it down into several key areas that can be implemented methodically. Digital transformation isn’t really about technology but more on how organizations will be able to be in a state of constant revolution. The truth is for becoming a digital company is difficult, but those who don’t move in that direction, and per se move quickly, will become a prime contestant to be disrupted. Digital transformation is not about creating a fancy responsive website or be present on social media. For those who still believe that digital transformation is solely about creating social media sites or developing a responsive website, here is the hard truth: Digital technologies will disrupt value chains, organizational structures, operational processes and revenue, models. How will digital transformation affect my industry and business? Is my organization ready for the digital transformation? What are the essential next steps needed to redefine my company’s role in the digital world of tomorrow? The modern digital transformation can be collected to the Industrial Revolution. As the innovations of that era, digital technologies have allowed organizations opportunities to boost performance and efficiency that even a few years ago would have been unthinkable.As history shows in many occasions, technological progress will prevail. 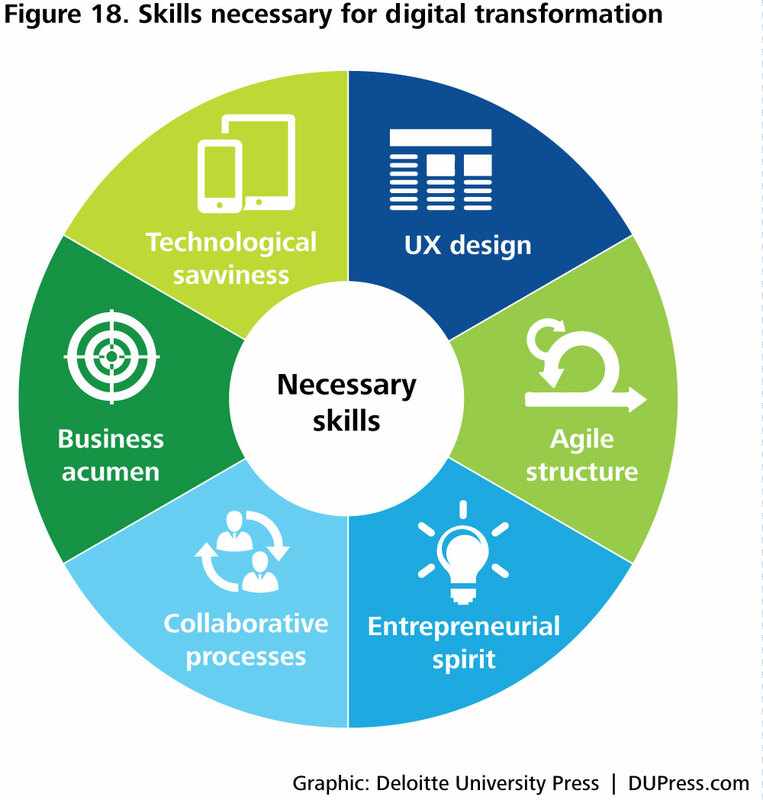 Therefore, rather than resisting the digital transformation, people and organizations must prepare immediately and strategically for a skillset that will perpetually change and evolve. It implies for people and organizations alike to acquire a solid range of digital skills. In an effort to join the race toward digital transformation, many organizations have chosen to train their staff members to use software. While developing such technical skills is a worthy decision, teaching someone which button to push to create a bar chart or how to sign electronically a document is just not enough. A lot of people fear their jobs are in danger of extinction if these solutions are set in place. While others are quite nervous about security concerns when it comes to cloud solutions, and still, others feel digital technologies will substitute the human touch, and make the landscape fully digital, sterile and Automated. People need to understand that Digital transformation still has a long way to go, and since all these technologies are constantly evolving, it’s very unlikely we will ever reach a point in which the transformation will be fully complete. There are going to be a lot of obstacles to pass along the way, but as digital solutions are very soon becoming the norm, organizations will have to find ways to overcome these obstacles. I appreciate you and the time you took out of your day to read this! You can find more articles like this from me on my blog and while you’re there, take a look around and see what else I do as Digital Conversation Architect. For news and insights find me on Twitter at @naullyn and to see what I do when I’m not working, follow me onInstagram. To subscribe to my free newsletter Social Aeroposta: Your Travel Industry’s Weekly Agenda-Setting Dispatch. Click here! Your thoughts: How will the world be transformed by the digitalization?